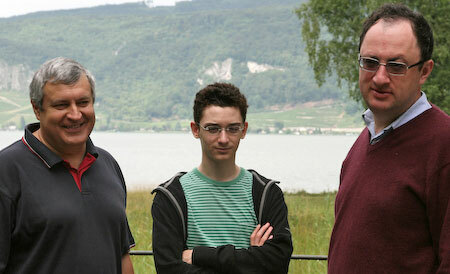 Decades Delight As GM Stripunsky Joins GM’s Chernin, & GM Yusupov For 2010 ICA Advanced Summer Camp! What better way to celebrate the new decade of ICA Summer camp adventures than by adding another GM to the ICA faculty? Alex Stripunsky has been a fixture of the ICA Open section tournaments for a few years now, and except for a few oddball flukes, a fixture of the first place prize for that section. Dubbed “The brain from Ukraine” because it rhymes, and because he was born there, Alex has faced a veritable who’s who of chess prodigies (i.e. Josh Waitzkin of ‘Searching for Bobby Fischer’ fame, and Hikaru ‘The Hammer’ Nakamura), and since he generally held his own, he will have no trouble in making future prodigies out of the kids who will attend during the weeks that he will be teaching. Joining Alex, will be ICA Advanced Camp veterans, GM’s Artur ‘Santa Clause’ Yusupov, and Alex ‘The Black Knight’ Chernin. Needing no introduction but usually getting it, Artur has been one of the best players in the world for the last two decades. At one time he seconded and coached current world champion Viswanathan Anand in his bid for the title, and if Artur helped the best player in the world, he can probably help the kids who attend the camp move beyond their current level of chess skill. Artur also holds wins against six world champions, including Vasily Smyslov, Mikhail Tal, Garry Kasparov, Anatoly Karpov, Vladimir Kramnik, as well as the above mentioned Anand. A perfectionist practitioner of the Pirc, and a one time champion of the USSR (1985), Alex Chernin has been a top performing GM over the past few decades. A masterful blitz player, Alex came in the third at the first official blitz championships in 1988, where he was able to pick up wins against both the eventual winner of the tournament, former world champion Mikhail Tal, as well as former world champ and then world title contender Anatoly Karpov. In fact Alex has a plus record against Karpov with two of the wins coming at the ’88 tournament, and one with the black pieces in 1992. Alex has also mentored Italian-American chess prodigy Fabiano Caruana, who is the highest ranked chess player under the age of eighteen. Please sign up today, so you can win tomorrow (or after that)!